1. To our knowledge, no evidence from a survey of this size or with similar methods has documented this finding. 2. Too often, schools roll out technology with limited support, and advocates expect positive impacts in unrealistically short time periods. Three figures from the report capture these findings. 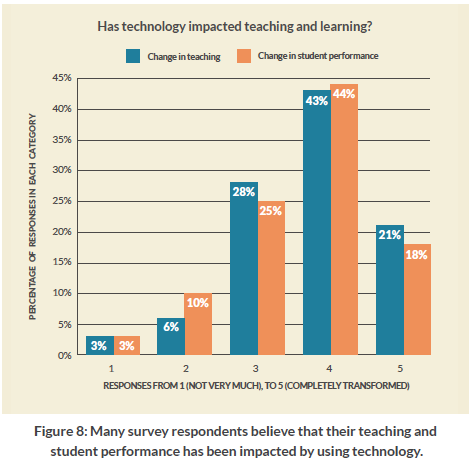 First, figure 8, on page 13 of the study shows that survey respondents believe that their teaching practices have changed by using technology, and their responses track closely with their views on whether their students’ engagement and/or academic performance has improved. For example, 20% said their teaching has been transformed, and 18% said that their students’ experience has been transformed. Because the survey does not capture a representative sample of all teachers, this finding does not mean that all teachers using technology are experiencing these outcomes. Nor is it a surprise that the teachers who believe their teaching has been transformed would also believe that their students are benefitting. These survey findings are also reflected in the statements teachers made in our focus groups and interviews. A future blog post will delve further into these ideas.